Chairs in the Arno, a synth-driven indie pop band in the vein of Barcelona, answer a few questions from MusicGeek.org regarding their music, their future, and the reception of their release, File Folder. Chairs in the Arno have previously been the subject of a MusicGeek.org spotlight. You seem to occupy the same general music area as, say, Barcelona and Sprites. How much affinity do you hold to them, and how influential were they in your musical development as a group? Jeff Excell and Becca Hsu: We are all really big fans of Barcelona. No other band was making such simple but genius synth-pop music. 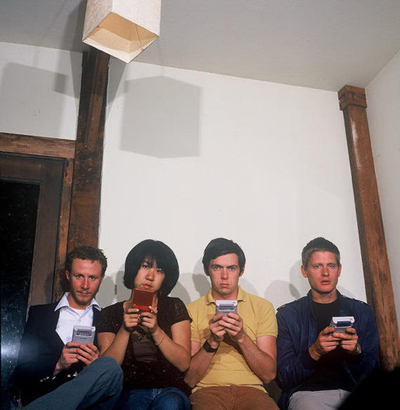 Their singer, Jason Korzen, who later went onto form the Sprites, basically made it seem “ok” to write lyrics about simple and enjoyable things. I would say they had quite an impact on the making of all our music. A couple years ago, Jason made a comment about how we were his “new favorite band” on MySpace. I think we all freaked out about it and almost peed our pants with excitement. Barcelona and the Sprites are WAY underated. We never wanted to convey some overly emotional or vital message in our songs, we just wanted to make music that we liked. It was kind of like music that you are embarrassed about listening to unless you want to dance around by yourself in your room. To this day, I still don’t put on Barcelona or the Sprites, or for that matter our album, without checking who is in the room. Further, what influences aside from music hold strong for you? What are you interested in? Becca: We’re all synthesizer fanatics and somewhat of computer addicts, but technology aside, being outdoors on sunny afternoons and pretending to be globetrotters has always tickled our collective fancies. Also, a competitive game of badminton or Mario Kart 64 could occupy a whole afternoon. Ryan’s affinity for languages has taken him around southern Europe more than once. Jeff Excell constantly obsesses over synthesizers/lsdj and is depressed between baseball/soccer seasons. Jeff Knight loves cats and collects Casio keyboards (using them in his side project Beep Kitty). Becca Hsu is currently obsessing over bicycles. What would you describe as your primary lyrical themes? Jeff E. and Becca: I tried to stay away from anything too serious, some of our songs inevitably swerved towards relationships, but we harnessed that as much as we could. We just wanted to make a fun album. As much as we wanted to write about computers … robots … hacking/programming … none of us could actually claim that we are true computer “nerds” so we didn’t get super obsessed with computer and technology lyrics. We basically wrote about what we knew — graphing calculators, having fun, skinny guys, our cat. To put it simply, the theme was “our life at that moment”. How do you craft your sound? Jeff E.: Sometimes, by chance, we would write a song together, but I don’t think any of those songs made it to the album. Sometimes Ryan and Jeff K. would mess around on guitar and bass until they had something down. Other times, one of us would nerd out on the 505 till our fingers hurt and come up with something. It usually started with the poppiest synth line we could come up with, put across a pretty basic guitar bar chord, throw in some 505 drums, and make Becca sing with you about something you think is fun. Ryan bought a Moog Source and it had one amazing setting that is on “input delay” and “i never loved you anyways” that made sounding good seem easy. We tried our hardest to just keep it simple. How has File Folder been received since its release? Jeff E.: I don’t want to sound completely naive, but I was very surprised when Jenn asked to put the album out. Any kind of success that the album has is completely and totally unexpected. I’m blown away that people are actually playing it on college radio stations. It has surpassed my expectations completely. I hope that people just play the album and have fun and dance, or get inspired to write their own music. It seems like the few bad reviews that we have gotten have over-analyzed our songs. We were not trying to create a masterpiece, or some new genre of music, it’s just fun music. I think most people get it, or at least I hope they do. So … yay, I guess. What are your goals as a group of musicians? Jeff E.: I would love to put another album out as Chairs in The Arno but to be honest that depends on how well this album does. Ryan is back in Florence, Italy (where it all started). Jeff Knight is in Washington right now working and playing music as “Beep Kitty”. Becca and I are living in San Francisco, where we are working on an album for a side project called “little naps”. We want to do something a little more electronic than Chairs was. As much as I like the sound of guitars on the album, I hate playing them, so we are trying to take a more “chiptune” approach with “little naps”. As far as Chairs goes, if I can pry Ryan and Knight from their nests and get them back to California then I think we would do another album. Matthew Montgomery, MusicGeek.org editor in chief, interviewed Chairs in the Arno.